Arkansas based radio and TV personality, record producer, and country singer Gene Williams was an established figure in the local Arkansas country music scene during the 1960s. The Cotton Town Jubilee label has been the subject of a couple of German reissue LPs and CDs but never was spotlighted in the specialized press. Gene Williams was born 1938 in Tyronza, Arkansas, and attended high school in Dyess, Arkansas. He started his career in the radio business in 1958 when he took a job as a DJ on KWAM in Memphis, Tennessee. Eventually he became also the station's sales manager and began promoting Grand Ole Opry acts such as Flatt & Scruggs. In 1962, he created a new Country music stage show he called "Cotton Town Jubilee," which debuted on January 27, 1962. It was a live show held at the Rosewood Theater in Memphis and broadcasted over KWAM every Saturday night, featuring local singers and musicians as well as guest stars from the Opry. James O'Gwynn was the first guest star to appear on the show. Williams soon extended his activities by founding his own record company in the spring of 1962, the Cotton Town Jubilee label based in West Memphis, Arkansas. In addition, he also set up a music publishing company. 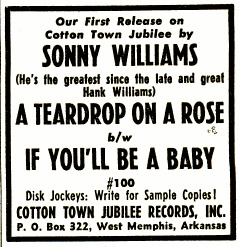 The first record release was by Sonny Williams, a talented singer who was a regular cast member of the Cotton Town Jubilee show. Born 1933 in Pisgah, Maryland, as Clyde Harley Bowie, he eventually took the stage name "Sonny Williams." He had cut two old Hank Williams numbers, "A Teardrop on a Rose" and "If You'll Be a Baby," for the label's first single. By August, Gene Williams had signed Chuck Edwards to a contract. Edwards was originally from Chicago. By June 1962, the Cotton Town Jubilee show had moved to the Hollywood Theater on 2469 Chelsea Avenue and grew in its popularity. Also the Cotton Town Jubilee label constantly released discs by new local acts Williams was promoting. In late 1962, Jay Chevalier and Cousin Jake & Uncle Josh, originally band members of the Flatt & Scruggs Foggy Mountain Boys, signed a contract with Williams. In early 1963, the Magnolia Play Boys were added to the label's roster and Williams set up a subsidiary called Dover Records. It was also reported by Billboard that Chuck Comer had been signed and afterwards, two singles appeared. At that time, Comer was a DJ on KSUD in West Memphis and also worked as a producer for the label. In addition, he wrote "I'd Give It All to Be with You" for Sonny Williams. On November 4, 1963, Williams debuted on KAIT-TV in Jonesboro, Arkansas with his new show, the "Gene Williams Country Junction Show," which eventually would run until his death in 2011. The new program also brought new artists to his Cotton Town Jubilee label. Ray Coble and Kenny Owens joined the show's cast as well as Marlon Grisham, Sylvia Mobley, Slim Rhodes, and others. Johnny Duncan, Alton Yancey, Bill Medlock, and Ken Burge made up the house band and likely also played on some of the label's releases. In early 1963, Jay Chevalier's "Too Many Bubbles" was a 'hit' record in some areas of the country. DJ Bob Luningham of KRZE (Farmington, New Mexico) reported that the song was the 'hottest platter in that area.' 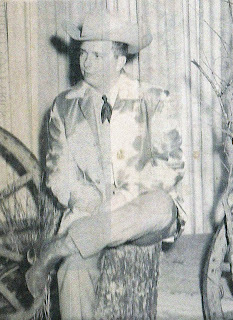 Chevalier and his band, the Louisiana Long Shots, also appeared at the Golden Nugget in Las Vegas at that time. A live LP recording from one of their appearances there was issued in 1963 on the Cotton Town Jubilee label. During the next two years, the Country Junction show proved to be very popular across the South and was broadcasted on different stations in Arkansas, Tennessee, Mississippi, Texas, Oklahoma, Missouri, and Kentucky. In 1965, Williams released a LP featuring many of the artists that appeared on the show. While the Cotton Town Jubilee label folded sometimes after 1965 (the catalogue has at least 15 releases), the Country Junction show ran up to 2011 (later renamed the "Gene Williams Country Television Show"). Williams died in December 2011 and was buried at Potter's Cemetery in Lepanto, Arkansas. Would you know if this is where Porter met Spec? Thanks for another regional label story. 107: Bob Taylor : If I Had Back What I Used To Have / ? 106 = Chuck Comer I Had My Fingers Crossed / ? 116 = Sonny Willaims Too Much Competion / ? Wow talk about a ton of information for any country fan, simply great. Not to up on the old country singers here but love the history, will be bookmarking for future reading. Hi Eddie, sure would like to know more about your uncle. Do you have an email adress?